Well, the Indian summer in SF was fun while it lasted. I enjoyed every bit of feeling the warmth and the light of the sun. 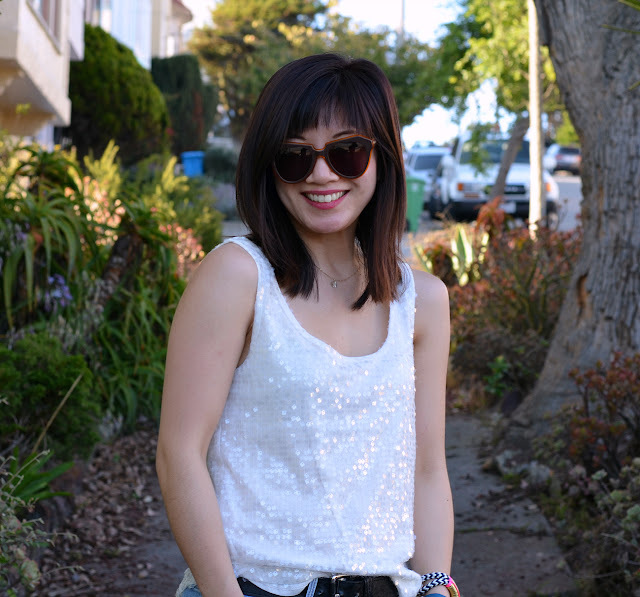 I wore this fun sequin top from Forever21 and offset the dramatic shimmer with worn-in shorts and Chucks. Everything was, and everyone felt, lightweight and playful...and for a moment people forgot it was fall and not summer. love this casual look. it's been super hot here as well! Ok, not to be too bratty, but I would have loved a week of 80 degrees. Not 2 days of scorching hottness. Man, I was dying. This outfit is really cool, love the combination of sequin top with less formal clothes! oh goodness nancy i love this look! it's so casual but the sequins make it SO FUN! hey nancy! REALLY cute sequined top and I'm a big fan of chucks. I always wanted some pink ones. HAHAHA Michaels inventory definitely captures your attention. I looked at wreaths last! HAHAHA Thanks for your comment girlie. LOVE this casual outfit but with a sequin top, so so cute! What a nice outfit!love your denim short!perfect simple look but still cuic! great post honey, i really love your tee!! Aw loving the boy/girl style thing going on here! Those rough and tumble shorts and cute sneakers are so much more fun paired with sequins! I love this look. The contrast between the ripped shorts and the sequin T is very chic. Ahhhh. Converse...you can never go wrong! Casual & cute - I LOVE the cons! haha i miss those indian summer days! the sequined tank is perfect! that's a lovely sequined top! I love the casual cut of these pieces, and how it's fancied up with a bit of sequins. Perfect! I heard about the crazy temps there in SF! CRazy, Crazy, but a great opportunity to wear some awesome summer stuffz, like that lovely tank! Sparkles! you look so pretty! love thiis look on you! happy friday love! xO! LOVE the sparkly top!! Following you on BlogLovin!! Feel free to followback!! Have a great weekend! You are so awesome at mixing feminine pieces with casual or edgy items. I just LOVE it!